MEANT TO BE opens in Ocean City with Lauren sitting quietly on the beach, lost to her thoughts. The winds blows her hat down the beach ... and it is rescued by a passing jogger, Rad. This chance encounter leads to 24 hours of frolicking in the seaside resort. James paints an all American picture of a lonely woman, orphaned by 9/11, and the vivacious man who sees something special in her. It is a foreshadowing of their reunion when both Lauren and Rad meet again in Afghanistan to employ their talents to neutralize a very real threat. James captures the innocent bliss of Ocean City only to jar my emotions with the dangerous mission in Afghanistan. 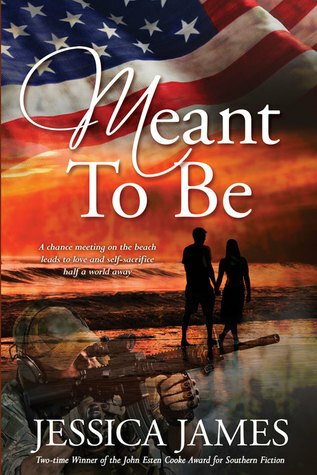 MEANT TO BE is a love letter to the men and women who serve and sacrifice for the freedom we enjoy. 1. Leave a comment about your favorite "junk food" found on the boardwalk - saltwater taffy? corn dogs? popcorn? During their time in Ocean City, Lauren and Rad indulge in the local favorite Thrasher's Fries. 2. Comments are open through Saturday, July 13, 10 pm in Baltimore. 3. I'll post the winner on Sunday, July 14. I love funnel cakes ... too made my thighs do, too! I wonder if fish & chips count. Nothing like freshly caught fish. Yes, fish & chips count and yes, it is delicious! Nothing like munching on caramel popcorn as you walk down the boardwalk! I'd have to go with the salt water taffy - haven't had that in years. Dolle's saltwater taffy or Candy Kitchen, Fisher's popcorn, sometimes fudge, and steamed blue crabs--I grew up going to Rehoboth, but we usually take our family "downy ocean, hon!" to Ocean City. Salt water taffy is delicious! Two of my favorite childhood memories are of vacations in Wildwood, New Jersey. My favorite treat from the boardwalk..." What else..? Salt water taffy!! I always enjoyed a stick of rock when we went to the seaside. I only live 12 miles from the beach here, but rarely go. I have to go with funnel cake - I can't remember the last time I had it which makes me want it even more. Corn dogs and Indian fry bread. Funnel cake is my favorite. I keep seeing people say funnel cakes and I've never had one. I really want to try one of those.